Vincent grew up eating hot dogs with applesauce. Most people shudder at the thought. The purists demand mustard but realize that ketchup is how most American children take their wieners. How is it that little Vinnie mixed the favorite condiment for pork chops with a beefy link? The reality is that his mother was cooling the temperature of Vincent’s lunch by instructing him to put applesauce right on the steaming hot dog. And now as a man, it’s a pairing Vincent treats as natural as peanut butter and jelly. In silence we forgive pregnant women their cravings. Pickles and ice cream being the most classic. We “forgive” them because it breaks our own internal order of what goes with what. We don’t understand how others aren’t following culinary “rules.” Pickles are for hamburgers and BBQ. Not for sweet and creamy dairy. Great artists know the rules and know when to break them. Take for example the unexpected appetizer which landed at our table. 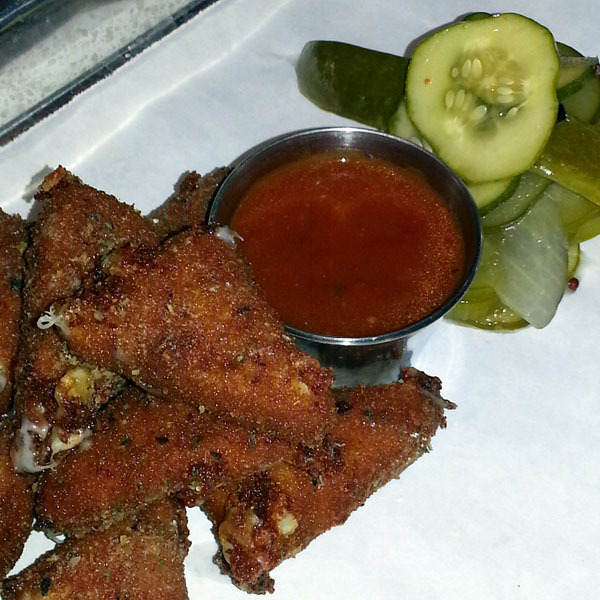 Fried mozzarella and house-made pickles. The waiter offers this starter gratis. There must have been a mistake at another table. Maybe someone didn’t realize that they ordered this freakish dish and refused it on sight. 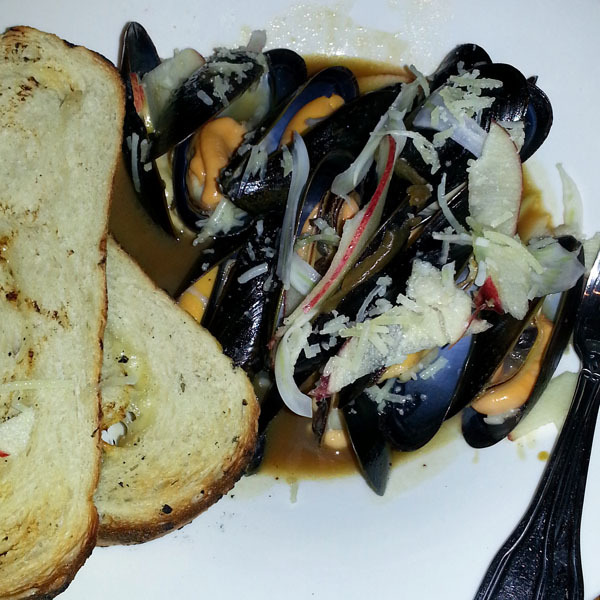 It turns out to be the best thing we ate at Umami Mia, an Austin-based pizzeria. Their principle aim is to drive meaty flavors on stretched dough. They adore the heavenly feeling of the fifth taste so much, that they amp up their own tomato sauce with hoisin. Hoisin, like soy, mushrooms, anchovies, olives and tomatoes themselves behave like meaty flavors on the tongue. They carry glutamic acid that lights up our taste receptors. By why pickles? Their house-made pickles bath in herbs and brine. They carry sour and salty tones which contrast the crunchy gooey cheese. Combined with the Umami Mia tomato sauce, a perfect harmony dances on the palate. The restaurant Linger based in Denver, too has an eye for the unusual. They frequently mash up ideas from different continents in the hope of delighting diners. Muscles steam in wine before they cradle in french onion soup. Gruyere cheese melts on top. The crusty bread sits eagerly on the rim of the bowl waiting it’s turn to dive into the heady onion broth. Umami, umami, umami. All the way umami. Then paper thin slices of apple land like snowflakes on top. Bright fruit taste with just enough acid to provide intrigue. Does eating cottage cheese with black olives and raisins count? Absolutely. Seems worth a try, too. Funny how we never seem to have all three ingredients at home at the same time. Great ideas I bet Isaac would love the leery and strawberries! And they’re in sosean!! What nutritional value do pickles have? (no judgement actually just asking)! ?